This is how it comes in the box! Kids like to be active and jump around. Parents don't always like them to be so active and jumping around while they're in the house. 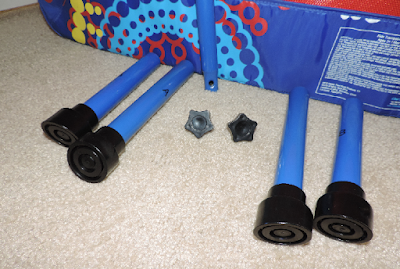 One Step Ahead has found a way to make both parent and child happy with the Kids Trampoline with Handle. Have them jumping in a safe, secure spot instead of jumping off the walls, and everyone has peace of mind. It's super easy to put together. There is an instruction sheet, and make sure you read it because it tells you which way your slanted feet have to face for the trampoline to be flat. I love the bright colors on the material. These are great for a boy or girl! The mat is already attached to the frame so assembly really takes about five minutes. The pretty, bright fabric is gender-neutral and it looks bright and cheery. The legs are lettered for easy assembly. I like the soft, cushioned handle that makes for easy gripping and adds stability. It's ergonomically designed/slanted to make it just right for the little ones to hold on to while they're jumping. The trampoline is lightweight and can easily be moved from room to room. It holds up to 80 lbs. The trampoline is a great way to let the kiddos burn up some energy. It's excellent for parents in that it's light enough to easily move from room to room, and you can do whatever you need to do while the kids are jumping safely and happily on their trampoline. I know it's a wee bit early for some, but I have to note too that this would be a FUNTASTIC 'big gift' to have under the Christmas Tree. And it's a gift that will keep on giving. It's definitely going in the Holiday Gift Guide. Just a note for an FYI: One Step Ahead has a great credit option if you want to pay monthly payments, and you can learn about that here. Learn more about this trampoline by visiting the website. You can also follow One Step Ahead on Facebook and/or Twitter. Now I have great news too!! There is a giveaway! One lucky winner is going to get a Kids Trampoline with Handle to call their own. Great giveaway - some young kid is going to be very happy! My kids want a trampoline in the worst way. I want to get them one, but I am nervous that one of them will fall off. I like that it has a handle to help the kids to balance. It says the assembly only takes five minutes so it should be easy to semi- breakdown and store when not in use. Supposed to be good for your health too, Manzi told me that. So let them jump away each day. This looks so fun! I bet the my girls would have loved something like this when they were little. Awesome giveaway! The handle is a super smart idea. So many kiddos get hurt flying off of trampolines. I like the netting for the stroller. This would keep those huge blood sucking mosquitos off my son! I would love this for my little boys, their last one broke and they would love a new one! I learned that they have Halloween costumes. That looks like a fun thing to have. It would be ideal in the winter I would think. 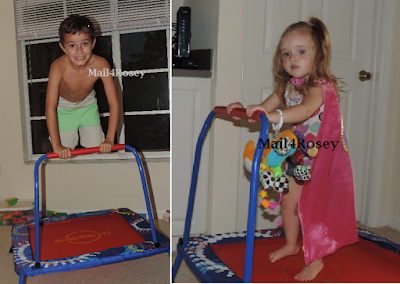 This is such a cute little trampoline for little jumpers! I like the halloween countdown chart. I like their credit option. I can use the SAFETY WARNING! My daughter always wanted one of these. It's perfect for my little jumper! That's a great little trampoline. I love that handlebar to keep the kiddos from falling. My sons school has this one, he loves jumping on it!! Looks like a lot of fun for the kids! I know mine would have loved this when they were little. Oh hOw I wish I could enter this too! Looks like it would be a blast! My kids would love this! Oh this would be a real blast! They look like they're having so much fun. What fun! I am sure it is a huge hit with young kids. I love that this is fun and a good way for kids to exercise. What a great product. Oh the grandkids would have a blast with this. Your crew looks like they are really having fun. What a great way to help kids burn off energy. I wish we had one of those when my kids were little. I visited the site and I love so many products there!! The Lovable Lobster Costume is one of my favorites!! Our kids always had an outdoors trampoline, but this would really come in handy when it's too cold, rainy, etc. to play outside. I like that it has a handle to hold on to. My girls would love a trampoline! I'm actually looking for a good one to get. I love that this can be set up indoors! I could use: Dri Nights Waterproof Mattress Protector for Isaak. It seems like once every few months he'll wet the bed still. This trampoline looks awesome! It looks very durable and I love that it can be set up inside. The boychild would love this. He's been asking for one for a while. Maybe I will pick him up one for his birthday. I agree many parents have a great concern & fear that their kids should not hurt themselves when they play around. And the Kids Trampoline with Handle sounds like a great product where they can have all the fun with no worries for the parents. My kids would love this! We had a small trampoline but it broken and they have been heartbroken ever since. This is a great way to keep kids active. I will have to share this with my friends with little ones. My daughter picked the lobster costume. Thank you! I just bought a very similar trampoline from a garage sale and it has been a favorite toy of my boys. We love One Step Ahead products--such great quality and they are also so creative. This looks like a super fun trampoline. My kids would enjoy something like this. Plus, its great exercise. I Like the Kids Ride-On Tractor with Trailer. My son has autism and jumping helps calm him down. This would be perfect for him. This would make a great Christmas gift for Nevaeh. Perfect for her age - she loves to jump. I am glad to be introduced to One Step Ahead, they have so many awesome products - like this Fresh Fogger Deodorizer. I am definitely spending some time checking them out! That looks like so much fun. I'm trying to think of Christmas gift ideas for my little nephews, perhaps I should give them one of these trampolines... lol my brother would hate me :) PERFECT! How cute is this! I bet our little one would love this. that mini trampoline looks awesome! My little niece has one and it is such a great toy for her - she is super active and it lets her urn some of her high energy off. What a fun little trampoline! When I had little kids One Step Ahead was all that we purchased. The products are inovative and they last a long time. I like that it is easily assembled. That looks like something the kids would have a ton of fun with! They would surely enjoy the mini trampoline. What's good about this is that it's easy to store and doesn't take much space. I love that this trampoline has a print on the fabric. It's so cute! I've never seen a trampoline like that before. I think my toddler would adore something like this! I had a trampoline as a child and loved it! Your kids look like they are having a blast with it! Oh this looks GREAT. I bet my two youngest would have a blast with this. My 4 year old uses my fitness trampoline and she loves it. I wish it had a bar though for stability. Maybe I'll get one of these so she will be able to have a little bit more balance. That's an awesome idea. That bar would definitely put me at ease with the kids jumping in the house. I love it because it looks easy to assemble & my son would love it! Oh my gosh I totally want this for my son! He has so much energy this would be awesome! Oh that looks fun! My 5 yr old would love a trampoline, and I'd feel a lot better with the handle. My sister had a trampoline like this when she was 5 (back in 2000)! It was perfect because she could bounce for a while on rainy days and it didn't take up too much room in our house! My nieces have been asking for a trampoline for a while now. This is perfect for them to have in the house and small enough that they can each have their own. There's a couple family members who could use this so maybe something gret to add to Christmas list. so cute. Love this. It's a great way to keep kids in one place, but still active. That way you can keep an eye on them and they can still be having fun. I love the kitchen helper. So many great things. I like the Outdoor Playhouse. I love the coat cubby, media carousel and the pre-spoon. They have a ton of great things! I absolutely love the Media Carousel! I like the Personalized Waterproof Outdoor Blanket. I like the One Step Ahead Spiro Hop Teeter-totter Seesaw. Thanks. I thought these were quickly outgrown-- up to 80 lbs is great! I wasn't aware! thanks for the info and opp! My son would love the Batman Dark Knight costume . I learned the products are pretested for quality and performance. One Step Ahead has a great assortment of home organization products like drawer & closet organizers. I like the products are tested. I learned that this revamped tramp features an ergonomic safety bar for easier grabbing. I like the Extra-Long My Cot Travel Bed. The Media Carousel is great for all of our books! I love the Spiro Hop Teeter-totter Seesaw!! I like the Toddler Little Lady Bug Costume. I really like the Li'l Squirt Baby Wading Pool. Looks fun! I learned that they have answers to many customer service questions on the site. They are having a toy-riffic sale right now. I learned about some amazing travel solutions that I would love to try soon. I learned that One Step Ahead also sells more Fun and Fitness items for kids such as the Stationary Bike and the Air Walker. My daughter would like the iLOL Toy Tablet. This would be great for getting out that energy in the winter! I also loved the Action Triangle baby toy! Love learning toys! I like The Lil Squirt Baby Pool!! I really like the Sesame Street Contoured Step Stool! The Halloween chart is awesome. It is so useful and fun for my nephew. The have excellent costumes. I'll make a note of that. I liked, as well as learned, they also offer Storage and Organization items! I really like the Folding Storage Ottoman.